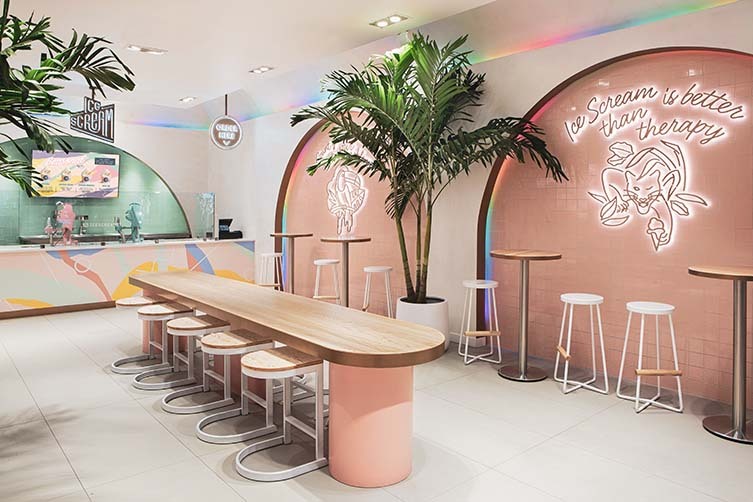 With interiors that hit the sweet spot just as much as the ice creams they turn out, the Bronx’s Ice Scream is a riot of modernism, pop art, 1950s kitsch design leanings and that irrepressible Memphis design of the 1980s. 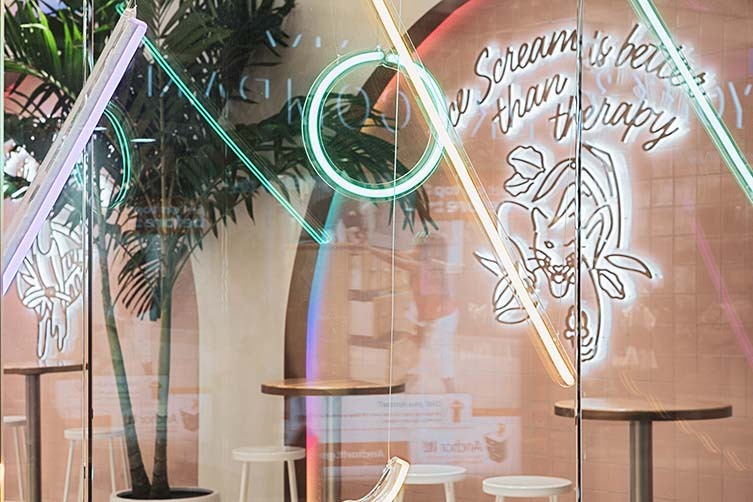 Situated in Mall at Bay Plaza, the colourful parlour is the first in the neighbourhood to use liquid nitrogen to whip up flavoursome shakes and ice cream, its vibrant interiors and branding attracting a constant flow of customers to the 24-seater hotspot. 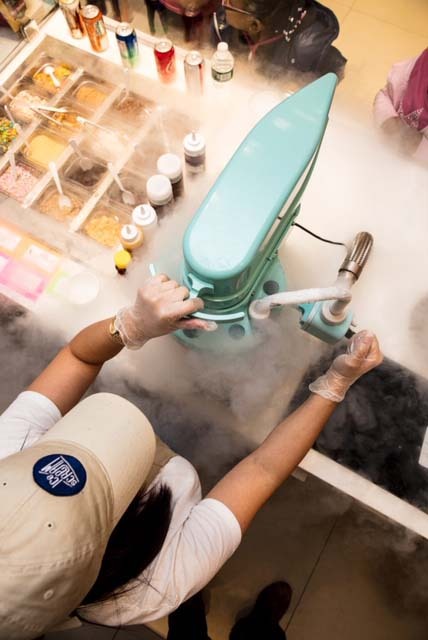 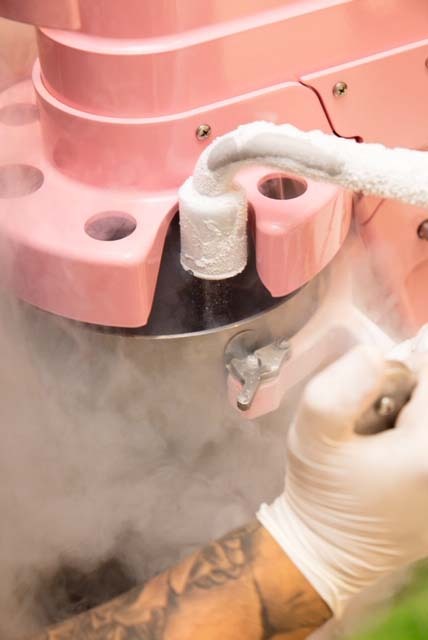 Using natural ingredients, Ice Scream create a better tasting ice cream with their liquid nitrogen process flash-freezing the products at minus 321 degrees Fahrenheit, a process so quick that that the ice crystals (water and milk molecules) end up microscopic, with the ice cream tasting creamier and all-round yummier than the long-standing traditional methods. 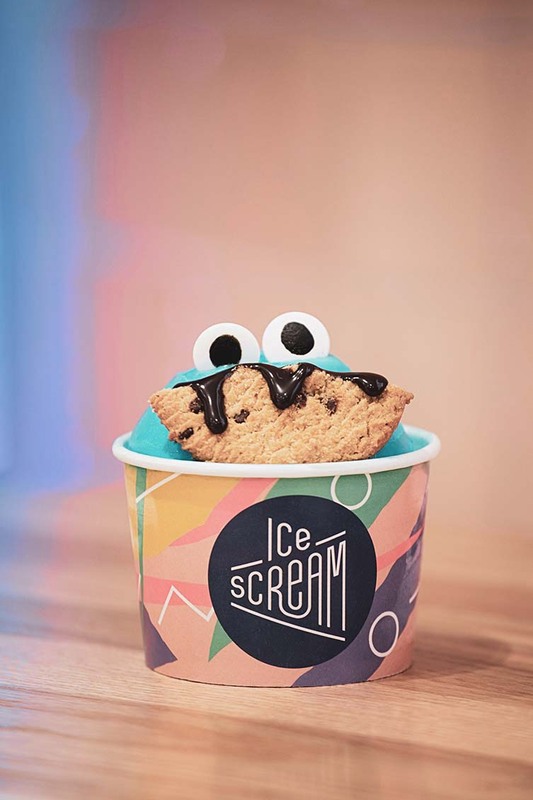 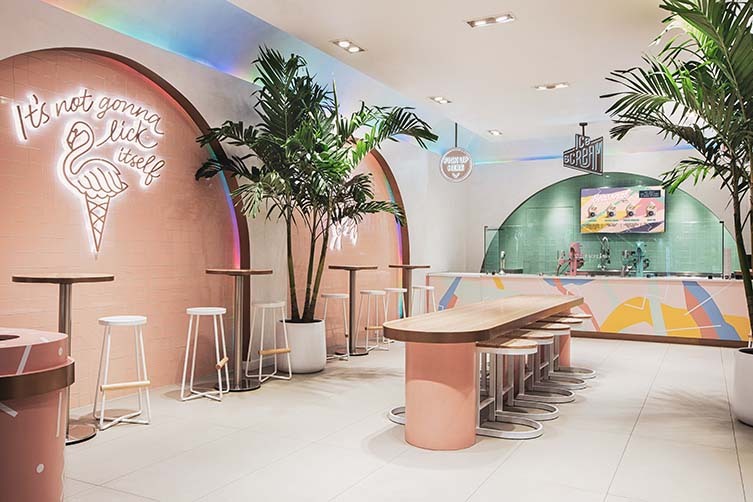 The bold and Instagram-ready interiors—designed by New York-based design firm Asthetíque—stoke feelings of nostalgia, the old-fashioned ice cream parlour having had a modern update; one that features an abundance of light and colour. 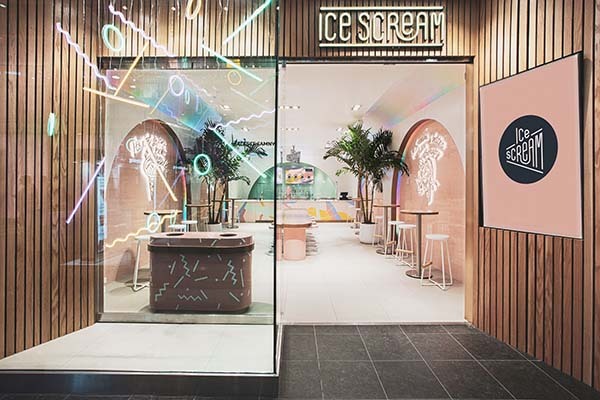 Geometric neon shapes appear to float in the storefront, drawing attention to the nitrogen attraction further inside; whilst four arches accented by multicoloured led lighting—slowly alternating its hues—creates a sense of perpetual movement that adds to the theatre of the ice cream-making process. 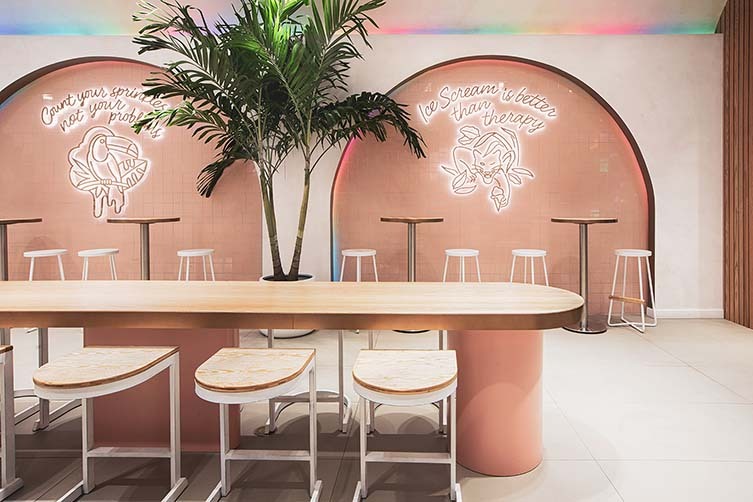 A communal table takes centre stage, with smaller tables perched under lush greenery along the sides of the petite space. 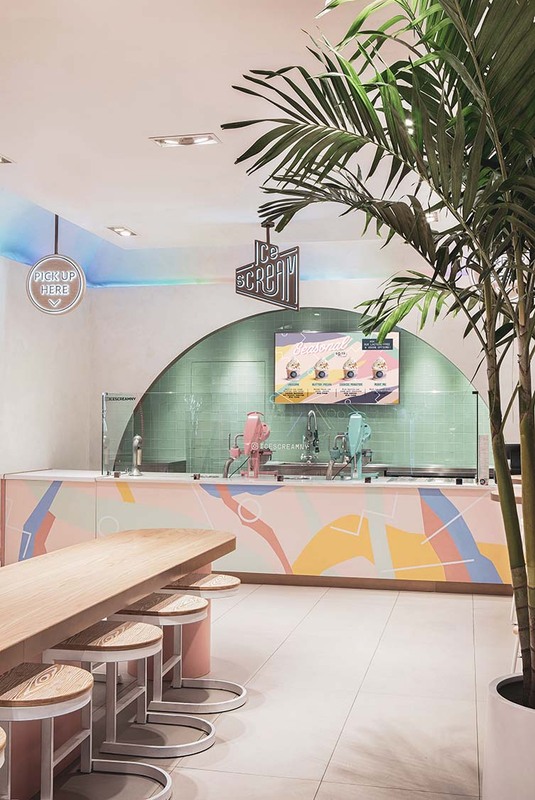 Neon slogans roaring the likes of “Ice Scream is better than therapy” lead visitors toward the counter area which sees the smoke-filled magic happen amid a combination of pastel pinks, blues, and yellows that form an abstract camouflage print overlaid by white geometric shapes. 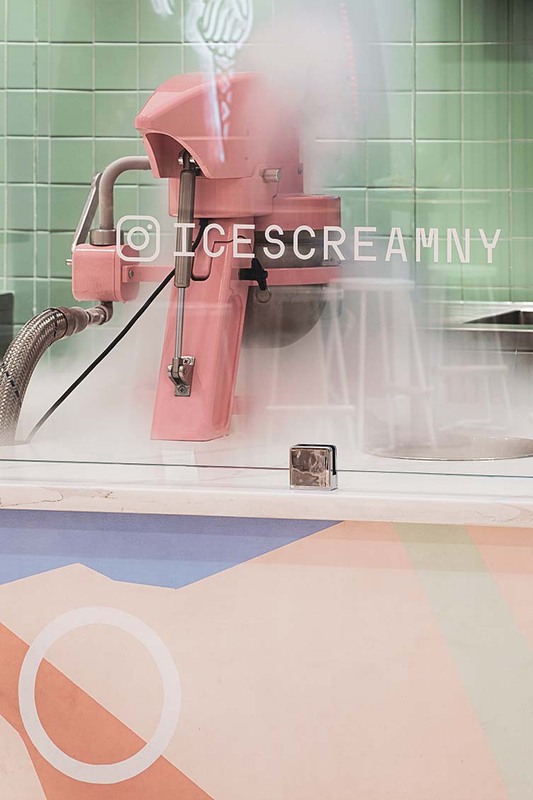 Vibrant, tasty and fun, Ice Scream bellows merrymaking diversion with its combination of culinary theatre and brilliantly kitschy aesthetics. 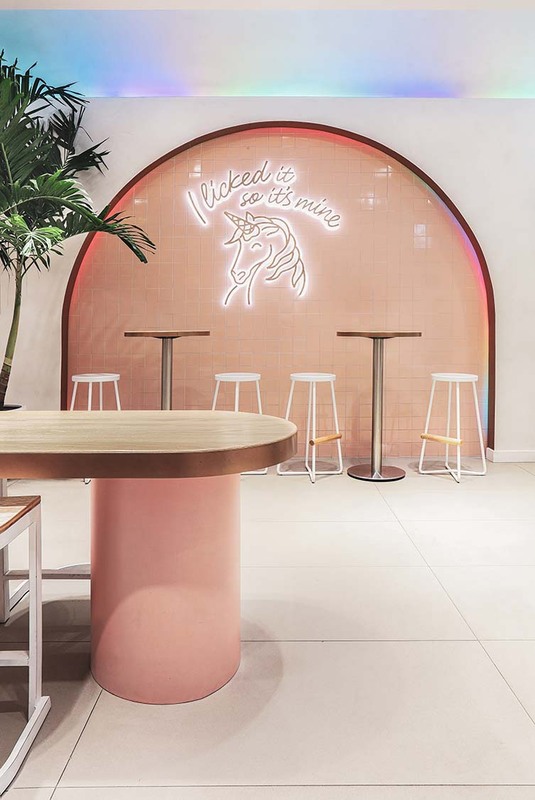 A true spot for leaving pretentiousness at the door and indulging in some irresistible, uninhibited fun.